234-236 Clarendon are located on the west side of Clarendon, between Commonwealth and Newbury, with the First Baptist Church to the north, across Alley 435, and 232 Clarendon to the south. 234 Clarendon and 236 Clarendon were built ca. 1872 for publisher Newton Talbot, designed as a symmetrical pair. He sold 234 Clarendon and retained 236 Clarendon as his home. 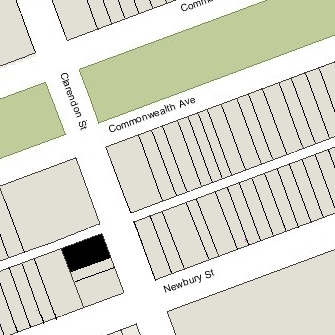 The land for 234-236 Clarendon – with a frontage of 45 feet — was part of a parcel running between Newbury and the alley that Newton Talbot had purchased from the Commonwealth of Massachusetts on May 16, 1871. That same day, he sold the southern portion – with a 48 foot frontage – to Isaac Sweetser, who resold it to architect Charles Amos Cummings, who built 230 Clarendon as his home. On January 1, 1872, Newton Talbot sold the lot in between – with a 19 foot frontage – to building contractor Uriah H. Coffin, who built 232 Clarendon on it. Click here for an index to the deeds for 234-236 Clarendon. On November 1, 1872, 234 Clarendon was purchased from Newton Talbot by Henry Hall Tuttle. He and his wife, Helen Maria (Smith) Tuttle, made it their home. They previously had lived in Dorchester. He was a retail boot and shoe merchant. Helen Tuttle died in March of 1874, and Henry Tuttle continued to live at 234 Clarendon. He remarried in June of 1879 to Elizabeth Pettis, and they moved soon thereafter to 321 Commonwealth. On January 26, 1880, 234 Clarendon was acquired from Henry Tuttle by Annie Hardon (Burr) Farlow, the wife of Dr. John Woodford Farlow. John Farlow was an ear, nose, and throat specialist, and served as an instructor in laryngology at Harvard Medical School. 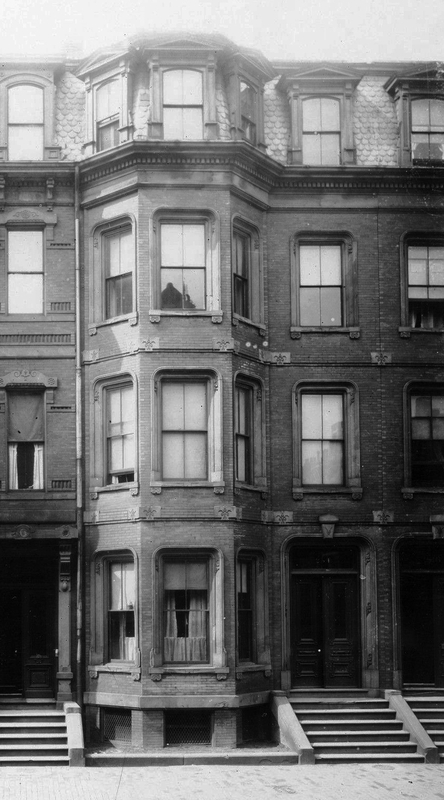 The Farlows continued to live at 234 Clarendon during the 1896-1897 winter season, after which they moved to 258 Beacon. They continued to own 234 Clarendon and Dr. Farlow continued to maintain his medical offices there until about 1915. After they moved, 234 Clarendon became a combination lodging house and medical offices. Among the residents were Dr. Rockwell Augustus Coffin, a physician, who also maintained his medical office there from about 1897, and Harry H. Walker, a stockbroker, who lived there from about 1909. Harry Walker continued to live there until about 1914, when he moved to Natick. Rockwell Coffin continued to live and maintain his medical office there until about 1918, but had moved to an apartment at 350 Commonwealth by 1920. On March 12, 1924, 234 Clarendon was purchased from Annie Farlow by real estate dealer William H. Agry as trustee of a real estate investment trust he formed in 1912 with Edward N. Chase and Ralph E. Johnson. It continued to be operated as a lodging house. On April 8, 1926, 234 Clarendon was acquired from William Agry by real estate and insurance broker Herbert Freeman Winslow. He and his wife, Carrie Homer (Clark) Winslow, lived at 18 Commonwealth. On May 9, 1928, 234 Clarendon was acquired from Herbert Winslow by E. Sohier Welch, William Appleton, and Robert H. Gardiner as trustees under a trust established in October of 1915. The trust was established by William Appleton and his nephew, Charles Philip Beebe (the son of James Arthur Beebe and Emily (Appleton) Beebe), to administer their property for their benefit. On July 14, 1928, the trust acquired 236 Clarendon. Newton Talbot and his wife, Calista (Clement) Talbot, made 236 Clarendon their home. They previously had lived at the St. James Hotel. Her was publisher of Ballou’s Monthly Magazine. 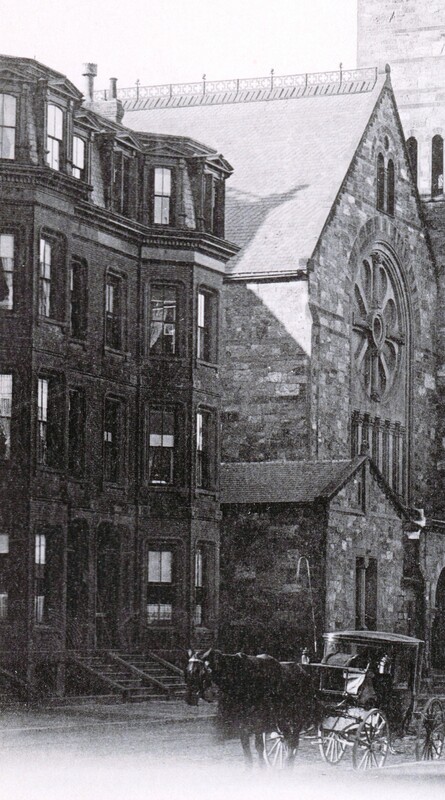 They continued to live at 236 Clarendon during the 1880-1881 winter season, but moved thereafter to 200 Dartmouth. 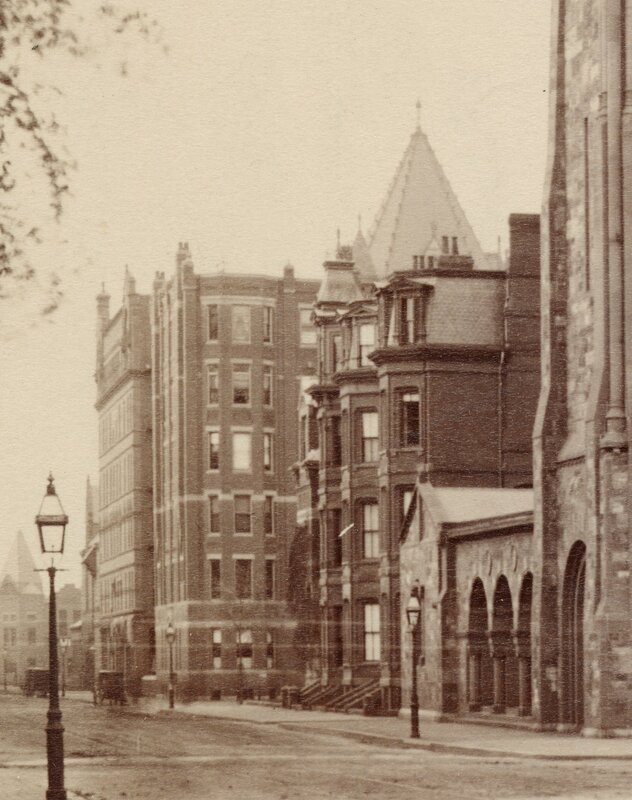 On September 21, 1881, 236 Clarendon was purchased from Newton Talbot by Archibald M. Howe and James Murray Howe, trustees for the benefit of John M. Forbes. By the 1881-1882 winter season, it was the home of Dr. John Phillips Reynolds, a physician, and his wife, Jane Minot (Revere) Reynolds. He also maintained his medical offices there. They previously had lived, and he had maintained his office, at 7 Park Square. On March 13, 1890, Jane Reynolds acquired 236 Clarendon from the Forbes trust. John Reynolds retired in late 1890 and they went to Europe, where they remained for several years. 236 Clarendon was not listed in the 1891 Blue Book. On March 13, 1890, 236 Clarendon was acquired from Jane Reynolds by Emma (Magrath) Stuart Holbrook Jones, the wife of Dr. Daniel Wayland Jones, a physician. The previously had lived (and he had maintained his office) at the Hotel Royal at 295-297 Beacon. They were joined at 236 Clarendon by Emma Jones’s son by her first marriage (to Hazen Stuart), Dr. James Henry Stuart, also a physician, and his wife, Henrietta (Parkhurst) Stuart. Dr. Jones and Dr. Stuart both maintained their medical offices at 236 Clarendon. Emma Jones died in February of 1901 and 236 Clarendon was inherited by James Stuart. D. Wayland Jones died in November of 1910. On August 12, 1912, James Stuart transferred 236 Clarendon into his wife’s name. Commonwealth in Brighton. He continued to maintain his medical office at 236 Clarendon. After they moved, 236 Clarendon became a combination lodging house and medical offices. James Stuart died in July of 1918 and Henrietta Stuart died in 1923. 236 Clarendon was inherited by her two sisters, Martha Grace (Parkhurst) McPherson, the widow of Samuel McPherson, of Westwood, New Jersey, and Elizabeth (Parkhurst) Hoesli, the wife of Henry E. Hoesli, of Ridgewood, New Jersey. On June 26, 1926, 236 Clarendon was acquired from Martha Grace McPherson and Elizabeth Hoesli by real estate dealer Henry C. Brookings. On July 14, 1928, 236 Clarendon was acquired from Henry C. Brookings by E. Sohier Welch, William Appleton, and Robert H. Gardiner as trustees under a trust established in October of 1915. The trust was established by William Appleton and his nephew, Charles Philip Beebe (the son of James Arthur Beebe and Emily (Appleton) Beebe), to administer their property for their benefit. The trust had purchased 234 Clarendon in May of 1926. 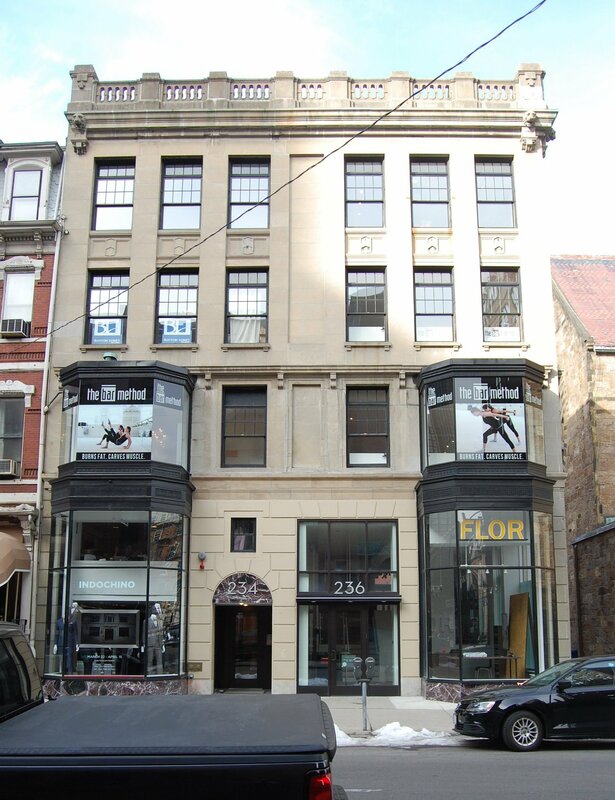 In October of 1929, E. Sohier Welch applied for (and subsequently received) permission to combine 234 Clarendon and 236 Clarendon, replace the front façade, and convert the building into offices. The remodeling was designed by architects Monks and Johnson. William Appleton died in March of 1932, and his one-half interest in 234-236 Clarendon and other trust properties was transferred to his estate. On December 11, 1959, 234-236 Clarendon was acquired from the trust and from William Appleton’s estate by Robert H. Gray, Milton B. Gray, and Mervin D. Gray, trustees of the Clarendon Realty Trust. The property subsequently changed hands. It remained remained a retail and office building in 2016.